Day 68 of the 90 Days of Awesome is in the bank! What made today awesome? I took Rosie for a walk on Mill Avenue tonight. 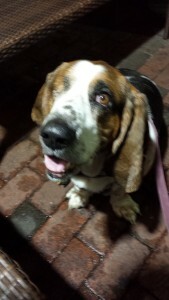 Rosie on Mill Ave. – Patiently waiting for her share of my ice cream. Rosie and I both seemed to be a bit antsy tonight. It had been raining off and on for a few hours but the weather had cleared a bit. I wasn’t in the mood to be super social so I grabbed Rosie’s leash, loaded her into the car, and took her to Mill Avenue for a walk. I love taking Rosie to Mill – lots of interesting smells and people who are excited to see and pet her. Rosie is the bell of the ball when we walk on Mill. It’s so cute to see everyone gush over her. Rosie and I also stopped at Sparky’s Creamery and shared a cup of French vanilla ice cream with raspberries in it. I tried to snap a picture of her sitting in anticipation of ice cream goodness, but you can’t expect a pup to hold still when ice cream is imminent. Rosie was so tired by the time we finished our hour-long walk up and down Mill. When she got back in the car she laid down immediately and stayed there for the entire drive home. Now she’s sacked out on the cool tiles in the condo. She’s going to sleep well tonight. In case you missed it: Day 67 of the 90 Days of Awesome – I celebrated 11 years of sobriety!